After months of behind-the-scenes diplomacy and breathless media speculation, it finally happened: Chinese President Xi Jinping and Japan Prime Minister Abe Shinzo met for a handshake and brief talks on the sidelines of the APEC summit. The meeting, held on Monday morning, was short and (by all appearances) uncomfortable – and it was infinitely better than the alternative of no talks at all. The meeting was made possible by months of quiet diplomacy that led to the issuing of a carefully crafted statement. That “four-point consensus” was released on Friday after talks between Chinese State councilor Yang Jiechi and Japanese National Security Secretariat chief Shotaro Yachi, who is a leading foreign policy advisor for Shinzo Abe. The document allowed China to claim it had made progress on issues of great concern, especially the disputed Senkaku/Diaoyu Islands, while Tokyo can rightfully claim it has not altered any of the Japanese government’s long-standing positions. Xi and Abe both endorsed the four-point consensus in their talks, as well as emphasizing the need for China and Japan to have a smooth bilateral relationship, given their proximity and economic importance to the Asia-Pacific region. However, according to Xinhua, Xi also took the opportunity to warn against historical revisionism and militarism. Abe reportedly pledged that his government would maintain the positions adopted by previous Japanese administrations with regard to historical issues. In terms of concrete outcomes, there wasn’t much here – the meeting itself, the first ever between Xi and Abe, was its own deliverable. However, Abe told Japanese media that he and Xi had discussed setting up a “maritime liaison mechanism” that would help prevent accidents at sea. In particular, the hotline would allow Chinese and Japanese defense officials to talk with each other and prevent tensions from escalating. The construction of this communication mechanism will be on the agenda for future China-Japan talks. The Xi-Abe meeting is most significant because of its symbolism. It marks a return to the normal state of bilateral relations, where China and Japan are holding regular diplomatic discussions. As Abe put it in comments to Japanese reporters, the meeting “represented a first step toward improving [bilateral] relations, by having Japan and China return to a starting point of a mutually beneficial relationship based on common strategic interests.” In other words, the Xi-Abe meeting is important not because the two leaders made any breakthroughs, but because their meeting paves the way for other high-level (and low-level) diplomatic contacts. Those lower-profile discussions are where the hard work of repairing China-Japan ties will actually take place. A Xinhua commentary placed the onus for continued better relations squarely on Japan, saying, “The top priority now is for Tokyo to honor its commitment and join China with concrete actions to fully restore the heat and vigor of bilateral ties.” Of course, this is similar to rhetoric Chinese media used before the Xi-Abe meeting, but Beijing still proved willing to work behind the scenes with Japanese diplomats to ensure the resumption of ties. 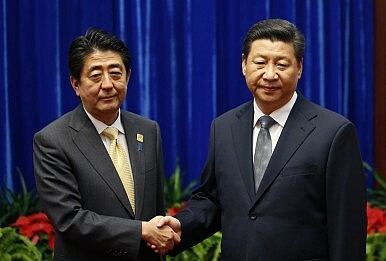 The commentary addressed this contradiction by attributing “China’s agreement to the [Xi-Abe] meeting” to “Beijing’s magnanimity and sagacity.” The commentary also reminds readers that this “magnanimity” can easily be revoked should Japan fail to follow through on the commitments made in the four-point consensus. While the “Thucydidean Trap” of a rising power and an established power coming into conflict is usually discussed with regards to the U.S.-China relationship, similar elements are at work as Japan and China try to adjust to a shifting geostrategic reality in the Asia-Pacific. To overcome structural tensions and avoid the “Thucydidean Trap,” China needs a “new type of major country relationship” not only with the U.S., but with Japan as well. Given the sensitive historical issues at play, fixing China-Japan relations may prove even more elusive than recalibrating ties between China and the U.S.